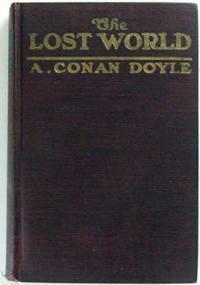 ::Robosexual::: Arthur Conan Doyle's "The Lost World"
Arthur Conan Doyle's "The Lost World"
Certainly most are familiar with Conan Doyle as the author of the Sherlock Holmes stories – a most entertaining series, but he also wrote other things. Among these is the short novel “The Lost World,” about a secluded area of South America in which dinosaurs have continued to exist, as well as other things. The story was written in the 20s and has since has been adapted into various forms, hacked and redone so many times and ways that it has become cultural knowledge, practically, without our even knowing. Jurassic Park owes a great deal to it, obviously, as well as many adventure flicks - as in Indiana Jones and such. Like Jules Verne’s novels, with which it is often confused, it is a sort of timeless, archetypical adventure, and its age has not reduced its charm and thrill. The narrator is a man who wishes to win the fancy of a certain lady – a lady who is enamored of the men who, as they often did in that age, went off into the wild to hunt tigers, or discover savage lands and kill the inhabitants thereof. In short, she wants a man like me. Regardless, he decides that he will accompany the indomitable Professor Challenger on a foray to what the Professor has reported to be a strange and wonderful land where prehistoric lizards still roam. They are joined by another, more skeptical Professor and a famous big game hunter who hopes to bring home his rarest trophy yet. The book is ostensibly in the form of press releases sent back by the narrator to the newspaper for which he reports, though it only shows itself at the beginning and end of each chapter, in which the narrator describes breathlessly how eventful the past days have been and warns this may be his last transmission, respectively. In any case, the writing is very good turn-of-the-century style, what you would expect to find in any given Holmes story. It is not so florid that fast-paced action is disrupted by the long-windedness of the author, as sometimes can be the case in that era, but rather is only just sufficient to describe the scene while leaving something to the imagination. The plot is simple on a higher level (adventure to dinosaur land!) but is quite detailed, and one becomes caught up in the petty bickering and constant verbal sparring of the two professors, or in the wonder and growing familiarity with danger that the narrator develops. Day-to-day action is interesting and logical, though usually encapsulated enough that it doesn’t entice you to read just one more chapter. All in all, The Lost World is a great sort of afternoon-by-the-pool or sitting-at-the-coffee-shop read. Not too serious, but good and complex enough that you won’t feel like you’re reading fluff. It’s a classic, and its only like 100 pages to boot. Grab one of the thrift editions for a buck fifty, it’s well worth the investment.